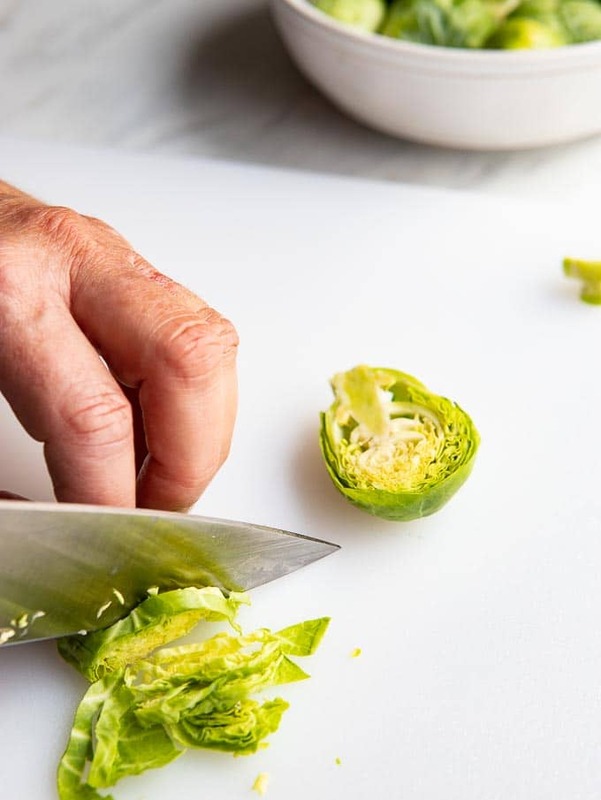 If you’ve ever wondered how to trim and prepare brussels sprouts – you’ve come to the right place! Here’s a handy tutorial to answer all of your Brussels Sprouts questions. Everything from how to choose, store and trim these awesome winters vegetables. Brussels sprouts are generally sold loose or cut off the stalk. In some markets and at farmers markets, you can sometimes find them still on the stalk. Brussels sprouts on the stalk tend to be a bit fresher so if you can buy them that way… do it! When buying brussels sprouts, look for ones that are deep green with tightly closed heads. Brussels sprouts with yellowed leaves are older and have a stronger and more bitter flavor. Brussels Sprouts can be stored up to a week in the refrigerator but are best cooked within 2 – 3 days of purchase. Avoid washing brussels sprouts until just before cooking. Excess moisture shortens the storage life of brussels sprouts. 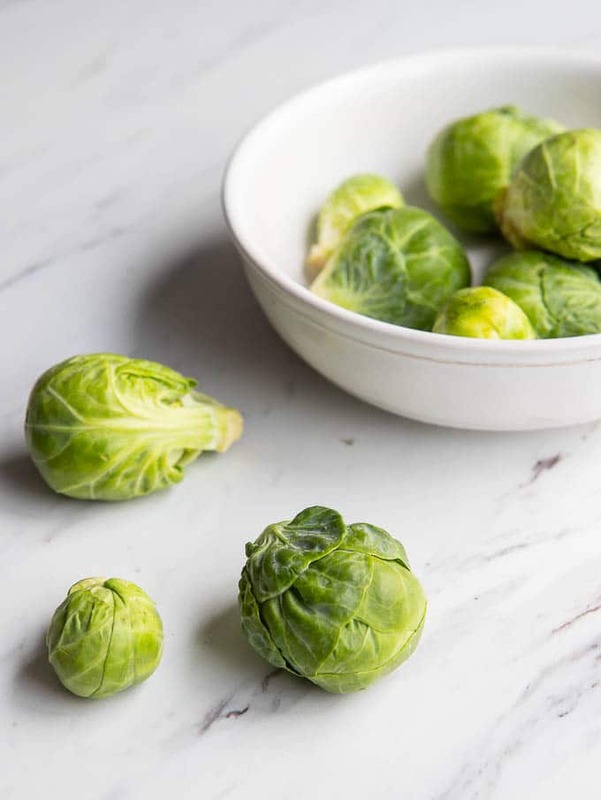 What are Brussels Sprouts – aren’t they just mini cabbages? Brussels Sprouts aren’t mini-cabbages – but they do belong to the same family! With a cabbage, we eat the head of each cabbage plant. Brussels Sprouts grow on a stalk – although the number of sprouts per stalk ranges, a single stalk can yield up to 3 pounds of brussels sprouts!! 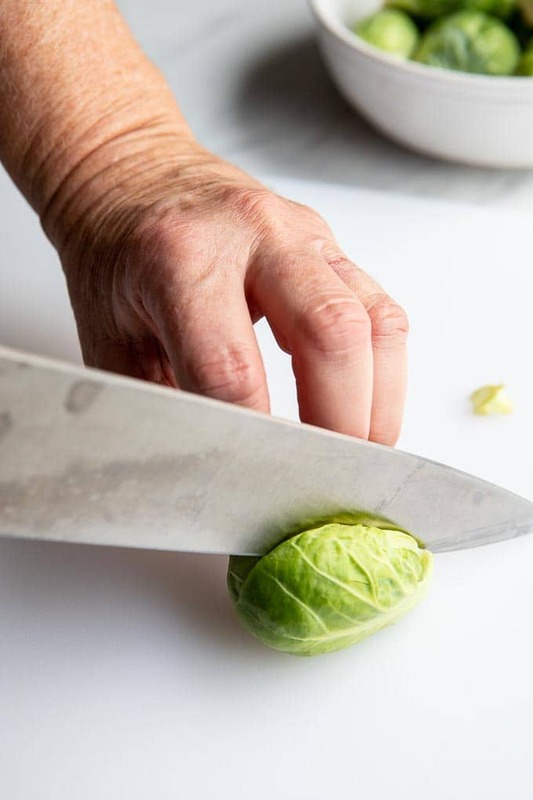 Brussels sprouts are very easy to trim – all you need is a sharp knife and a cutting board. Step #1 – Cut off the stem end of the brussels sprouts close to the base of the leaves. Step #2 – If the brussels sprouts are small (less than one inch in diameter) you can leave the brussels sprouts as is. If they are larger, however, you can slice them in half. Small, whole brussels sprouts and halved brussels sprouts are perfect for oven roasting, sauteeing or pan roasting and frying. Step #3: If you are planning to use brussels sprouts in salads or stir-frying them, you can slice them thinly. 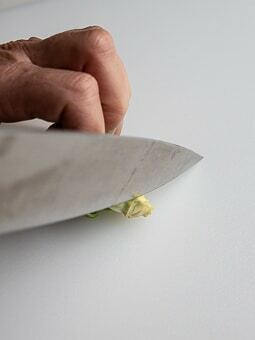 Place the cut side of the brussels sprouts flat on a cutting board and cut the brussels sprouts into thin slices. There are many delicious ways to cook brussels sprouts! Pan roasting is one of my favorite cooking methods – these pan-roasted Brussels Sprouts with Balsamic and Pomegranate are always a hit and incredibly easy to make. Oven Roasted Brussels Sprouts with Honey Balsamic glaze are one of my favorites! The quickest way to cook brussels sprouts is to cut them thinly and then saute them – this Sauteed brussels sprouts recipe is really quick to prepare and you can change up the seasonings for an almost infinite variety of flavors!! Thanks Valentina! So many people seemed to have questions about them that I thought a little primer might be helpful! I’m loving them too! Hope you and your family had a wonderful Thanksgiving… we definitely gobbled ’til we wobbled! !